On platforms that support Drag and Drop (DND) between applications, you can easily create tasks by dragging entries from the most common applications. Backgroud of currently visible Context view: A new task is created from the drop with the currently visible context applied. The task is assigned to "Inbox" so you can assign a specific project later on. 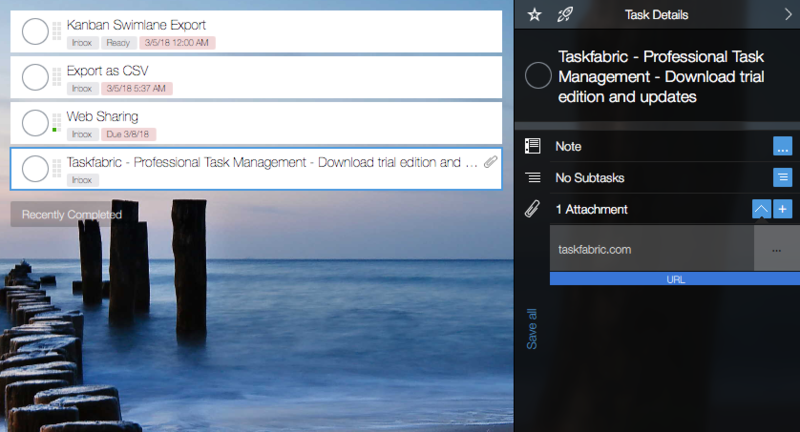 Each task with attachments displays a paperclip next to the task title. To show a list of all attachments to a task, open the Task Details Inspector and expand the "Attachments" section. The "..." menu next to each attachments can be used to view, save or delete any attachment. Safari (and other web browsers): Drag the URL from the title bar of your web browser (with some browsers you have to drag the icon left of the URL) to create a task with the URL address as task title. The URL is automatically added as attachment. If you select "View" for the attachment, the URL will be opened in your default web browser. Image File (from macOS Finder): This creates a task with the file name (including path) as task title. The image is automatically added as attachment. This makes a copy of your image file in the database, so the file can be synced to other devices. Additionally a small thumbnail image is created. The thumbnail image is displayed as header in Kanban mode. If you select "View" for the attachment, the image file will be opened in your default viewer for this type of file (i.e. Preview on macOS). Other File (from macOS Finder): This creates a task with the file name (including path) as task title. The file content is automatically added as attachment. This makes a copy of your file in the database, so the file can be synced to other devices. If you select "View" for the attachment, the attached file will be opened in your default viewer for this type of file (i.e. Preview on macOS). Microsoft Outlook for macOS: The subject of the mail is used as task title preceded by "MAIL". Additionally the original mail is added as attachment (.eml file). If you select "View" for the attachment, the attached file will be opened in your default viewer for this type of file (i.e. Mail or Outlook on macOS). This section is about the Win32 Edition of our App (available directly from our web site, not the Windows Store Edition). For the Windows Store edition feature set see section below. Microsoft Edge (and other web browsers): Drag the icon left of the URL from the title bar of your web browser (with some browsers you have to drag the URL itself) to create a task with the URL address as task title. The URL is automatically added as attachment. If you select "View" for the attachment, the URL will be opened in your default web browser. Image File (from Windows Explorer): This creates a task with the file name (including path) as task title. The image is automatically added as attachment. This makes a copy of your image file in the database, so the file can be synced to other devices. Additionally a small thumbnail image is created. The thumbnail image is displayed as header in Kanban mode. If you select "View" for the attachment, the image file will be opened in your default viewer for this type of file. Other File (from Windows Explorer): This creates a task with the file name (including path) as task title. The file content is automatically added as attachment. This makes a copy of your file in the database, so the file can be synced to other devices. If you select "View" for the attachment, the attached file will be opened in your default viewer for this type of file. Microsoft Outlook: The subject of the mail is used as task title. This section is about the UWP Edition of our App (available on the Windows Store). For the Windows Win32 edition feature set see section above. File (from Windows Explorer): This creates a task with the file name (including path) as task title. All news are published on Twitter and Facebook. Follow us and don't miss any update or preview!